One handy volume offers strategies for conducting ongoing formative and summative evaluation of nursing programs of all types. Systematic and ongoing program evaluation is critical across all nursing programs. But until now, there has been no comprehensive published literature to consult. 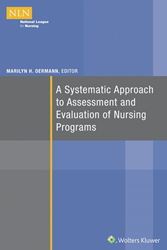 A Systematic Approach to Assessment and Evaluation of Nursing Programs (Wolters Kluwer, May 2016), edited by Dr. Marilyn Oermann, Thelma M. Ingles Professor of Nursing and director of evaluation and educational research at Duke University School of Nursing, meets that need. Dr. Oermann’s scholarship has long focused on nursing education, with an emphasis on both teaching and evaluation in nursing. With funding from the NLN and Laerdal Medical, she is in the process of completing a multisite study on maintaining competence in CPR among nursing students. She recently completed a feasibility study on the use of simulation for high stakes testing. Dr. Oermann is the author or co-author of 17 books (several of which are national award winners), more than 150 articles in peer-reviewed journals, and a wide variety of other publications. She is the editor of Nurse Educator and lectures widely on writing for publication and nursing education topics. She also serves as one of the leader/mentors for the NLN Scholarly Writing Retreat Program. http:// Order A Systematic Approach to Assessment and Evaluation of Nursing Programs here. Dedicated to excellence in nursing, the National League for Nursing is the premier organization for nurse faculty and leaders in nursing education. The NLN offers faculty development, networking opportunities, testing services, nursing research grants, and public policy initiatives to its more than 40,000 individual and more than 1,200 institutional members, comprising nursing education programs across the spectrum of higher education and health care organizations.